Just sold a couple of custom headers to a previous customer. Due to the signs distance off of the road, the 8 inch letters that came with the sign were not grabbing the eye of passing motorists. 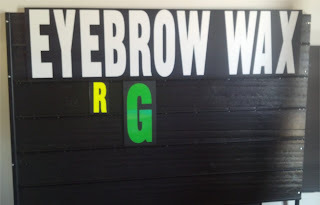 The fluorescent yellow "R" in about 8 inches tall, and the neon green "G" is about 16 inches tall. 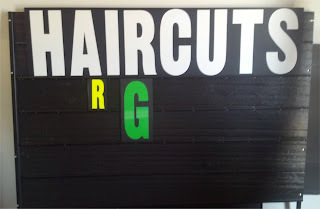 The "HAIRCUTS" header is still 16 inches tall, but the thicker letters make it hard to avoid. If you have an existing black sign OR are interested in buying a new black sign with an EXTRA large custom header, contact us! The custom header does add to the cost, but we believe you will be VERY happy with the results.